As an instructor of electronics, I am called upon frequently to help students troubleshoot their malfunctioning lab circuits. When I approach a student's self-built circuit to troubleshoot it, though, I often begin the process with a very different mindset than if I were troubleshooting a malfunctioning circuit on a real job site. Aside from different safety considerations and a very different work environment, what else do you think I might consider differently when approaching a student-built circuit? Specifically, how might the range of probable faults differ between a professionally-installed electronic system that malfunctions and a student's lab project that malfunctions? What generalizations might you make about this difference in troubleshooting perspective, regarding the construction and operational history of the circuit in question? Although sound troubleshooting technique will ultimately yield a solution, asking "pre-diagnostic" questions such as this will greatly enhance your efficiency as a troubleshooter. Discuss this with your students, enlightening them if possible with anecdotes from your own troubleshooting experiences. The CD player generates the audio signal to be amplified, while the equalizer/preamp modifies the tone of the signal to suit the listener's preferences and the power amplifier provides adequate power to drive the speakers. Being prepared at all times to troubleshoot electronic systems, you have a digital multimeter close by which you may use to check for the presence of audio signals (set the meter to measure AC millivolts). All audio signal cables (including the speaker cables) may be unplugged to provide access for your meter's test probes. My personal preference would be to unplug the output cables from the equalizer/preamp unit and test for signal output there. I'll leave the other steps up to you, to elaborate on in class discussion with your peers! Discuss with your students how this is an ideal application for the "divide-and-conquer" strategy of troubleshooting, where you divide the signal path into halves, checking for the presence of a signal at each half-way point, narrowing in on the location of the faulted component in a rapid manner. Explain why taking these simple steps may save a lot of time in the troubleshooting process. For example, why bother checking the amplifier's output signal if you already know it isn't outputting what it's supposed to? What, exactly, constitutes "good-quality" power for an amplifier circuit? It is usually a good idea to verify the exact nature of the malfunction before proceeding with troubleshooting strategies, even if someone has already informed you of the problem. Seeing the malfunction with your own eyes may illuminate the problem better than if you simply acted on someone else's description, or worse yet your own assumptions. The rationale for checking the input signal should be easy to understand. I'll let you answer this one! 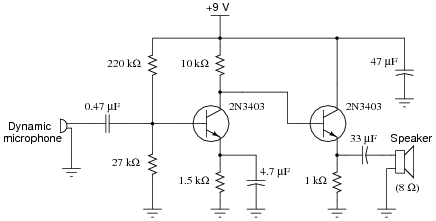 "Good-quality" power consists of DC within the proper voltage range of the amplifier circuit, with negligible ripple voltage. Follow-up question #1: suppose you discover that the "faulty" amplifier is in fact not receiving any input signal at all? Does this test exonerate the amplifier itself? How would might you simulate a proper input signal for the amplifier, for the purposes of testing it? New technicians are often surprised at how often complex problems may be caused by something as simple as "dirty" power. Since it only takes a few moments to check, and can lead to a wide range of problems, it is not wasted effort. Multi-stage amplifier circuits lend themselves well to the "divide and conquer" strategy of troubleshooting, especially when the stages are as symmetrical as these. What might happen if the 47 mF "decoupling" capacitor were not in the circuit? The question regarding the necessity of the 47 mF decoupling capacitor is tricky to answer, so I'll elaborate a bit here. Power supply decoupling is a good design practice, because it can ward off a wide range of problems. AC "ripple" voltage should never be present on the power supply "rail" conductors, as transistor circuits function best with pure DC power. 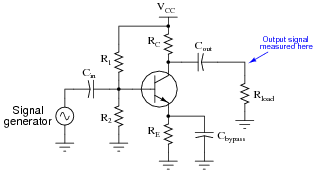 The purpose of a decoupling capacitor is to subdue any ripple, whatever its source, by acting as a low-impedance ßhort" to ground for AC while not presenting any loading to the DC power. Although it may not seem possible at first inspection, the lack of a decoupling capacitor in this audio amplifier circuit can actually lead to self-oscillation (where the amplifier becomes a tone generator) under certain power supply and load conditions! If the power supply is poorly regulated and/or poorly filtered, the presence of a decoupling capacitor will greatly diminish line-frequency "hum" noise heard in the speaker. For the rest of the questions, I'll let you figure out answers on your own! 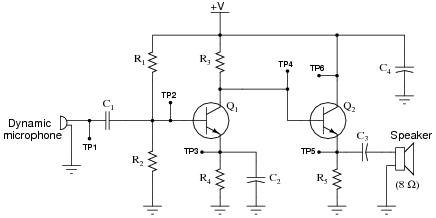 Incidentally, this circuit makes a good ïntercom" amplifier for a student project. 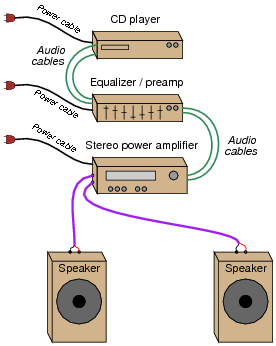 Using a small dynamic speaker for the microphone, and another speaker (or audio headset) on the receiving end of a long cable connected to the amplifier output, students can easily talk between two rooms in a building, or even between buildings. If the voltage changes to zero, I show 0 in the table. If the increase or decrease is relatively small, I use thin arrows (� or �). If the change is great, I use thick arrows (� or �). Follow-up question: why don't test point voltages VTP1 or VTP6 ever change? I encourage you to research information on these devices' failure modes, as well as glean from your own experiences building and troubleshooting electronic circuits. Follow-up question: When bipolar transistors fail shorted, the short is usually apparent between the collector and emitter terminals (although sometimes all three terminals may register shorted, as though the transistor were nothing more than a junction between three wires). Why do you suppose this is? What is it about the base terminal that makes it less likely to "fuse" with the other terminals? An organization known as the Reliability Analysis Center, or RAC, publishes detailed analyses of failure modes for a wide variety of components, electronic as well as non-electronic. They may be contacted at 201 Mill Street, Rome, New York, 13440-6916. Data for this question was gleaned from the RAC's publication, Part Failure Mode Distributions. Discuss with your students how to determine whether the bias voltage is too great or too small, based on the observed output waveform. It isn't difficult to do so long as students understand why biasing exists and how it works. Of course, changing either of these resistor values will alter the bias ("Q") point of the amplifier, which may necessitate subsequent changes in the value of either R1 or R2! 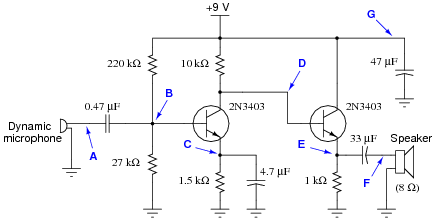 Another option to consider here is the addition of a negative feedback signal path to tame the amplifier's gain. This modification would have the added benefit of improving circuit linearity. Follow-up question #1: suppose that after testing this amplifier on your workbench with a "dummy" load (8 W resistor connected to the speaker terminals), you happened to notice that transistor Q2 was slightly warm to the touch, while transistor Q3 was still at room temperature. What would this extra information indicate about the amplifier's problem? 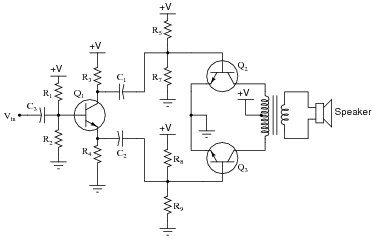 The symmetry inherent in push-pull amplifiers makes troubleshooting easier in some respects. As always, though, component-level troubleshooting requires a detailed understanding of component function within the context of the specific circuit being diagnosed. No matter how ßimple" the circuit may be, a student will be helpless to troubleshoot it down to the component level unless they understand how and why each component functions.